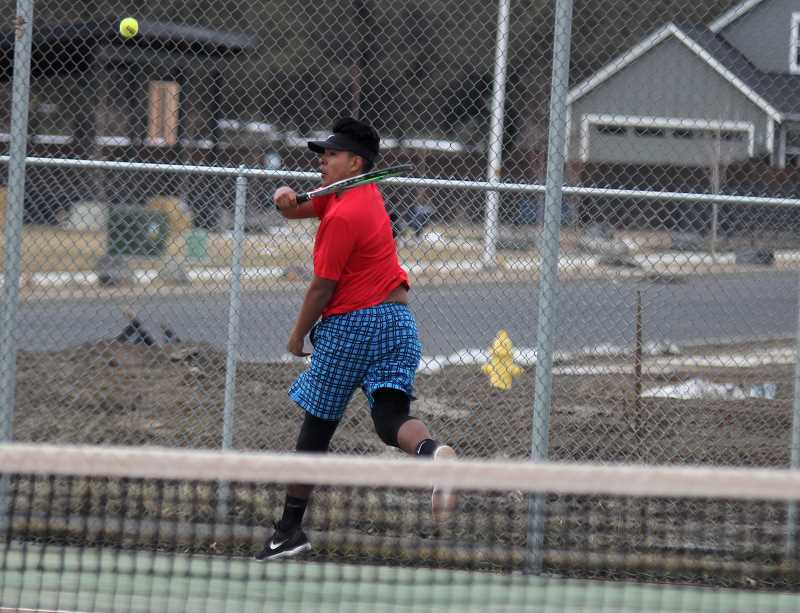 The Madras boys tennis team beat two out of their three challengers this week, topping Ridgeview and Crook County, but losing to Redmond. The White Buffalos had their first home meet of the season on Friday. The rain didn't allow for Madras or Crook County to finish all eight matches, but they were able to finish five matches and the Buffs beat the Cowboys 4-1. Roberto Garcia, of Madras, was able to win a 6-0, 7-6 (7-5), match against Moses Freauff for the only win in the singles matches for Madras. The doubles team of Esteban Gomez and Kobey Jorgensen, of MHS, beat the Cowboys' team of Jeremy McCullough and Yuga Yamaguchi, 6-2, 6-2. Sabastian Norato and Luis Mancera were able to get the White Buffalos another win, beating Nick Cushman and Ty Cross 6-2, 6-1. Madras also received a forfeit win in the No. 4 doubles spot. Madras traveled to Ridgeview on Thursday and bested the Ravens 6-2. No. 1 Madras singles player Tony Giron won a very exciting three-set match over Ethan Hicks, 4-6, 6-1, 7-5. Garcia took control of his match early and beat Aaden Poindexter 6-0, 6-2. The White Buffalos went 4-0 in their doubles matches over Ridgeview, starting with Gomez and Jorgensen earning 6-2, 6-2 victory over Aidan Marstars and August Johnson. "We did good, but we really could have worked together better on some easy things, like cross court, serves and communicating," Gomez said. "It is different with a new partner (Jorgensen), but I think we will get to a good level of play and make it far this year. This was only the second match together for Jorgensen and Gomez, but things are starting to look good for the new partners. "Being outside was a big difference," he said, referring to the late-winter snowfall that pushed practices indoors. "Our serves were really off, but they were better by the end. We need to be committed to each other and work hard, so we can go far this year." Sebastian Norato and Luis Mancera, of Madras, beat Sorem Stencliff and James Herrin 6-1, 6-0, while Madras doubles team Dapri Miller and Angel Ramos beat Kroften Nymon and Austin Allen 6-3, 7-6 (8-6). Anthony Young and Cankuna Chavez finished the sweep for the White Buffalos by beating Josh Kuhlman and Ben Schneider, 6-1, 7-6. 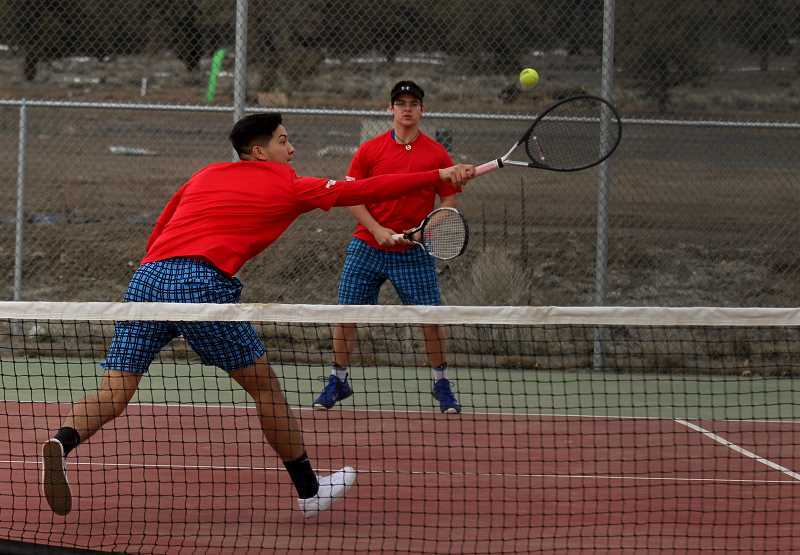 The boys tennis team lost to the Redmond Panthers 8-0 on March 19. Madras' Giron lost to Brenden Brooks 6-0, 6-0 and Coty Simmons, of MHS, lost to Benny Saito 6-1, 6-0. White Buffalo Garcia lost to Skyler Jones 6-0, 6-0, and Smith, of Madras, lost to Isaac Hathaway 6-0, 6-4. No. 1 Madras doubles team Gomez and Jorgensen lost 6-0, 6-2, to Chad Pilling and Jeff Hair. Mancera and Norato, as well as Kahne Herkshan and Byron Patt, both lost 6-0, 6-0. Miller and Ramos, of Madras, barely lost two sets to Garret Osborne and Willis Hunt 7-5, 6-4. The boys travel to Stayton to face the Eagles on April 2 ,at 4 p.m. and have a home meet on April 4, against Woodburn.